Sunday Woodcutter knows that she needs to be careful with her stories, for her words have a troublesome habit of coming to life. So Sunday devotes herself to writing down her own family's history, the stories of her parents and older siblings. When Sunday's only friend, a frog who dwells at an abandoned well in the forest, disappears and the prince of the kingdom unexpectedly decides to hold three balls, Sunday will have the opportunity to make her own stories, and her worlds will collide in unexpected ways. 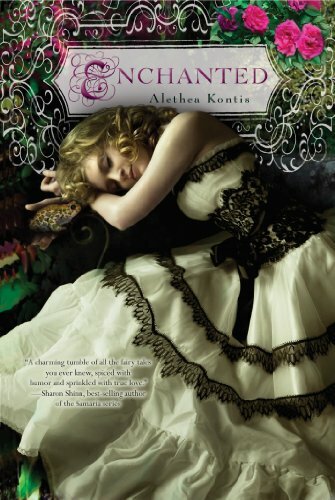 Enchanted is an aptly titled novel, as this entire story is so utterly enchanting and fun, full of magic and serendipity. Kontis creates a fun and engaging character in Sunday and her large family, and weaves in more fairy tale elements than you'd think could exist into a story without letting the threads get snarled. Sunday's world is enlarged when she loses her best friend, but her road to finding him again—in prince form, no less—is exciting as she discovers the true identity of her fairy godmother, the reasons behind her family members' special talents, and uncovers a terrible plot that could mean tragedy for the whole kingdom—and especially her own family. This is a delightfully charming book, with many little subplots and character sketches, and the start of what will hopefully be more books about the Woodcutters. Cover Comments: I like how bright and colorful this cover is, and I think that the pretty dress on the front will appeal to a lot of characters. I can appreciate how this cover really says "YA!" which I think is interesting, because I was really surprised that this book wasn't MG. Either way, it's pretty and I think it's doing it's job in attracting readers! I don't know why I haven't read this book! I will look for it immediately! Your blog is most likely the most influential blogs on this market. So my question to you is -- it's definitely a great cover, but do you think it hurts the book's male readership? Half the book is written from the male POV (and the next two books will be as well). Is this the kind of book you would recommend to your brothers or boyfriends? Why or why not? (Seriously..I'm curious). I loved all the fairy tale references in this book-it was so fun looking for them!